I didn’t know much about the real Chicago back in the 60’s and early 70’s. Not only was I a suburban kid, but I was a r-e-c-e-n-t suburban kid, having spent most of my young life banging about the world as the son of a career officer in the U. S. Army. 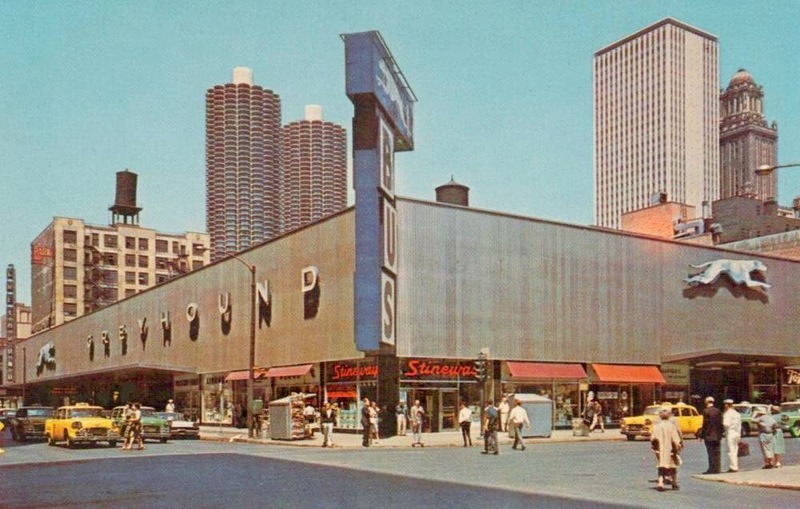 One thing I did get to know fairly well was the old Greyhound bus station on Randolph Street, located on the lot where the Chicago Title and Trust building stands today. I got off the bus from Dekalb there when I took it in from Northern Illinois University on my way to Union Station to pick up the gal of my dreams – my wife today – who took the Burlington Zephyr in from Macomb. In fact, I spent the morning of our wedding at the Greyhound station in January of 1972 where I was dispatched to pick up my cousin on her way in from Rochester, New York to attend the wedding. It’s gone now – the bus station, not the cousin – but I remember with fondness the escalators leading down from street level, the busy shops, and the crowded waiting room filled with folks headed to places all over the country. It was quite a place on an impressive piece of real estate, with the City-County Building, the brand new Civic Center and the First United Methodist Church of Chicago within view to the south. The lot on which the Skidmore, Owings & Merrill design was sited had quite a history of its own. 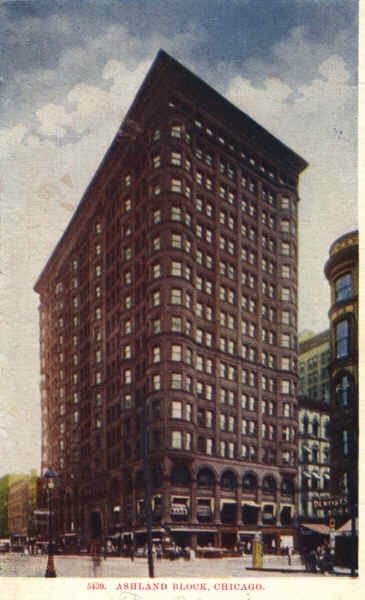 It was at this location that nine Chicagoans met above the hardware store owned by Jabez Botsford on May 31, 1850 to found a university that would “serve the northwest.” [Chicago Tribune, December 26, 1951] On that May day at the corner of Clark and Randolph Northwestern University began its life. A decade later the site held Colonel John H. Wood’s Museum, which held as its greatest attraction a 96-foot prehistoric fossil called a zeuglodon, unearthed somewhere in Alabama in 1848. You could see the zeuglodon for 25 cents, a reasonable price, it seems to me, to have the privilege of viewing a zeuglodon. [Chicago Tribune, July 8, 1951] The museum drew 10,000 visitors in its first six weeks of operation. Of course. That kind of crowd led to the conversion of some sections of the building into a 1,500 person theater, which opened in 1864. The play Divorce was scheduled for the night of October 8, 1871 but the show never went on. By the next morning Mr. Wood’s museum and theater complex was a pile of ash. Down the Ashland block came in 1949, replaced by what Mr. Korom calls an “architecturally mediocre bus station.” The original plans were far more ambitious, and had they been carried out we might very well be looking at the project today with the same admiration and awe that we view the Inland Steel Building a couple of blocks to the southeast. 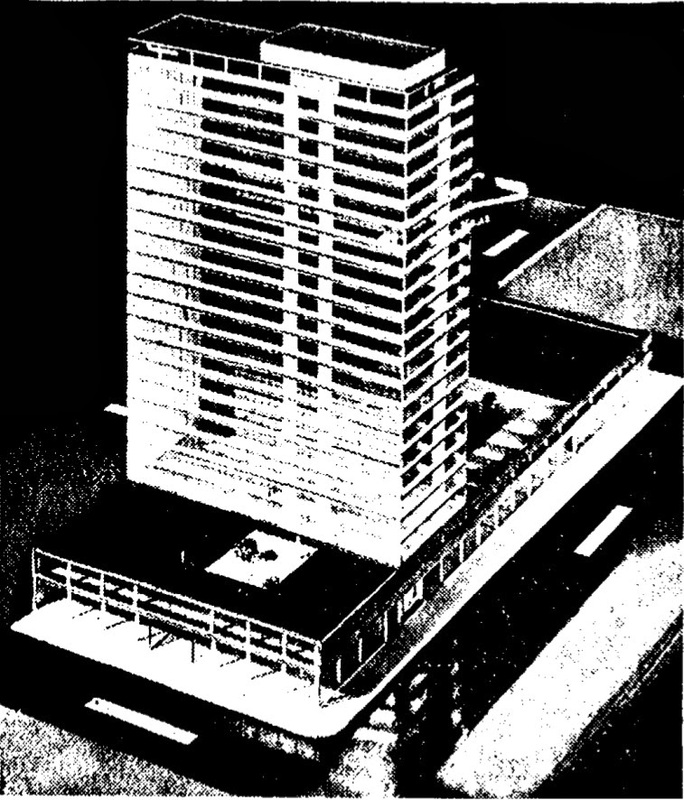 Initial renderings for what would have been the first tall building in the Loop since World War II (finished five years before Inland Steel and two years before the Prudential Building) a 20-story office tower above the bus station that has that sleek mid-century modern feel for which the architects, Skidmore, Owings and Merrill, would become known. Although the Greyhound folks had acquired the property in 1941, the war and post-war material restrictions held the project up for nearly a decade. Construction began in 1949 and was not without its challenges. One challenge was to keep the 300 or more buses (500 during busy holiday travel periods) that were planned for the terminal away from the busiest streets in Chicago. In order for that to happen a 225-foot private tunnel had to be constructed, connecting the bus terminal’s loading area with the lower level of Wacker Drive. On March 19 – 61 years ago today – the terminal opened in ceremonies attended by “several thousand” Chicagoans and Mayor Kennelly, the president and executive vice-president of the Greyhound corporation and the chairman of the Illinois commerce commission, George Perrine. The first bus to enter the terminal came from St. Louis and arrived at 2:40 a.m. on March 20, 1953. Three hours later at 5:15 a.m. the first departing bus left for Des Moines and Omaha. In 1990 the station was demolished and the operations were buried under the Eisenhower Expressway on Harrison Street, a place remote enough so that no one in the Loop would have to deal with the sight of bus folks waiting for their rides.